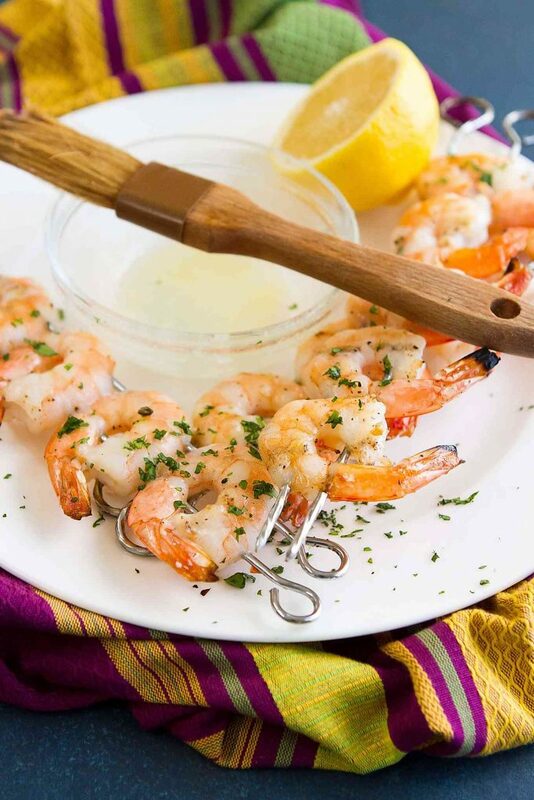 The most succulent grilled shrimp, brushed with lemon butter and ready to eat straight from the skewer! Serve them as an appetizer, or in pasta or a salad. As a kid, there was no food that I loved more than shrimp. It was the miniature bay shrimp, topped with a dollop of seafood sauce, that first struck my fancy. From there, it was all downhill for my parents’ wallets, as my adoration shifted to scampi and spot prawns, and eventually morphed to Dungeness crab and any kind of ultra fresh sushi. I was not a cheap date when my mind was set on seafood. Thankfully, I could be easily distracted and wooed just as easily with a burger and a slice of watermelon when necessary. To this day, I become starry-eyed at the promise of shrimp and will consume them in almost any form. But there was one experience that catapulted grilled shrimp to the top of the list. When we lived in Utah, my husband and I occasionally drove up to Park City for date nights. The long-ago mining town is now a thriving ski resort, complete with upscale accommodations and a bevy of fantastic restaurants. On one of our visits, we hit one of the Main Street restaurants for happy hour. The special that night? The most perfectly grilled shrimp that had ever passed my lips. Slightly charred on the outside and just barely cooked through on the inside. A smoky, succulent treat. After raving about the grilled shrimp to the server, he went to ask the chef about the preparation. Surely there must have been angels working in the kitchen to produce a bite so perfect! His secret was in two parts and, surprisingly, neither involved celestial intervention. 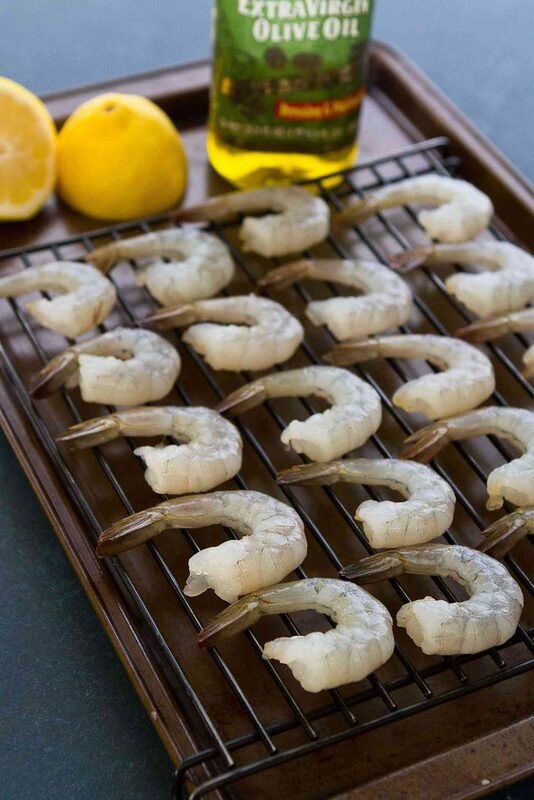 First, brush or toss the shrimp with olive oil, salt and pepper, then squeeze with citrus (either lemon or lime) after grilling. Easy enough. I opted to add some butter to the lemon in this recipe. Always a good choice. The second part, however, is really the key to the smoky, charred bits and pop of moisture that put these grilled shrimp over the top. Be sure that the shrimp are dry, dry, dry before tossing with olive oil and seasoning. Water is the enemy of the char! He recommended first patting the peeled shrimp with paper towel, then arranging them on a rack set over a baking sheet, and setting the whole thing into the fridge, uncovered, for about an hour to complete the drying process. If you have metal skewers, go ahead and use those, running the skewer through both the head and tail of each shrimp. If using thin metal skewers, doubling up for each row of shrimp can help avoid that annoying habit of spiraling around the skewers. If wooden skewers are more your speed, be sure to soak the skewers in warm water for 45 to 60 minutes before threading on the shrimp. This will stop the skewers from burning too badly or even catching on fire. What you do with the shrimp once they’re grilled is up to you, and there are many options. I’m partial to eating them with my fingers, straight off the skewers. They’re also great on a salad, or tossed with pasta and a simple white wine sauce. If using wooden skewers, soak in warm water for 45 to 60 minutes. In a medium bowl, toss the shrimp with the olive oil, salt and pepper. 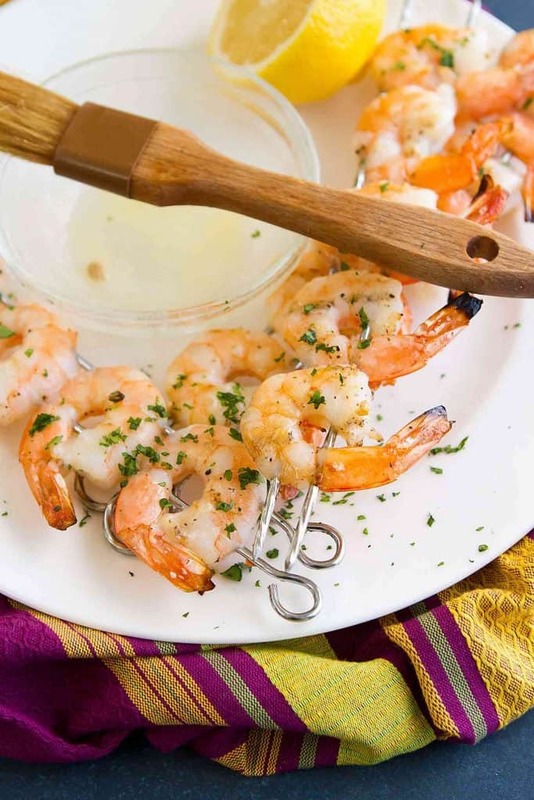 Thread the shrimp onto wooden or metal skewers, poking the skewers through both the head and tail of each shrimp. Grill the shrimp until just cooked through, about 1 minute per side. Do not overcook! In a small bowl, combine the melted butter and lemon juice. Brush over the shrimp. Garnish with parsley, if desired. Serve.